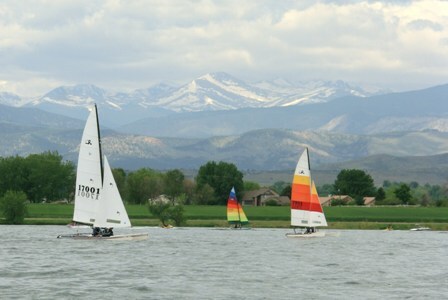 Boyd Lake State Park is located near Loveland, Colorado, close to Longs Peak. Since the lake is the park’s main feature, most of the park’s activities revolve around water sports; however the park also offers hiking and biking trails, hunting, and camping. The area that became Boyd Lake State Park had originally belonged to the Heinricy family, who filed for the land in 1879 under the Homestead Act. Heinricy descendants lost the property during the Great Depression. Subsequent owners leased the property to the State of Colorado in 1958 for creation of a wildlife area, which officially became a state recreation area in 1965. The Colorado Division of Parks and Outdoor Recreation purchased the property in 1978, according to a history prepared by the division. Several additional publications about Boyd Lake are available for checkout from our library, including a 1985 park management plan and various brochures. Visit the Boyd Lake State Park website to find out more about the park, including directions, things to do, campground reservation information, park alerts, a trails map, park facilities, and more. Don’t forget you can check out a parks pass from many Colorado libraries. Previous Curious about Library Supervision? Part I Registration is now open!